In this episode I talk to Jeff Sebo. Jeff is a Clinical Assistant Professor of Environmental Studies, Affiliated Professor of Bioethics, Medical Ethics, and Philosophy, and Director of the Animal Studies M.A. Program at New York University. 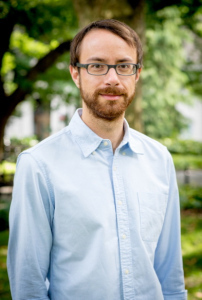 Jeff’s research focuses on bioethics, animal ethics, and environmental ethics. He has two co-authored books Chimpanzee Rights and Food, Animals, and the Environment. We talk about something Jeff calls the 'moral problem of other minds', which is roughly the problem of what we should to if we aren't sure whether another being is sentient or not. You can download the episode here or listen below. You can also subscribe to the show on iTunes and Stitcher (the RSS feed is here). 1:38 - What inspired Jeff to think about the moral problem of other minds? 23:14 - Understanding the Precautionary Principle: More plausible than the incautionary principle? 29:20 - Is morality a zero-sum game? Is there a limit to how much we can care about other beings? 1:03:54 - How does the moral problem of other minds transfer over to other cases, e.g. abortion and uncertainty about the moral status of the foetus? In this episode I talk to Angèle Christin. 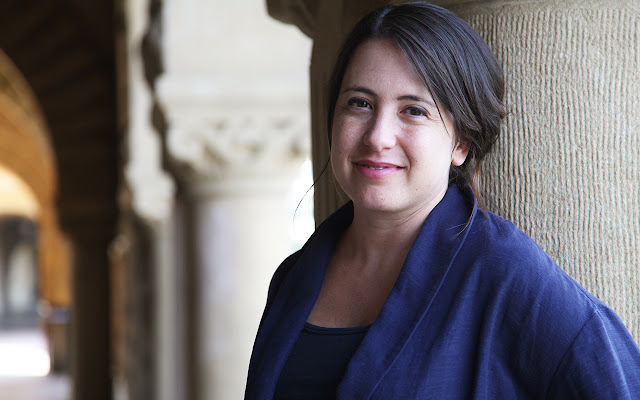 Angèle is an assistant professor in the Department of Communication at Stanford University, where she is also affiliated with the Sociology Department and Program in Science, Technology, and Society. Her research focuses on how algorithms and analytics transform professional values, expertise, and work practices. She is currently working on a book on the use of audience metrics in web journalism and a project on the use of risk assessment algorithms in criminal justice. We talk about both. You can download the episode here or listen below. You can also subscribe to the show on iTunes or Stitcher (the RSS feed is here). 1:30 - What's missing from the current debate about algorithmic governance? What does Angèle's ethnographic perspective add? 5:10 - How does ethnography work? What does an ethnographer do? 8:30 - What are the limitations of ethnographic studies? 12:33 - Why did Angèle focus on the use of algorithms in criminal justice and web journalism? 24:40 - What is 'decoupling' and how does it happen? 39:20 - What explains the ambivalent attitude to metrics in different professions? 44:42 - What is 'buffering' and how does it arise? 57:47 - Does the resistance/acceptance of an algorithmic tool depend on the nature of the tool and the nature of the workplace? What might the relevant variables be? Fading Away: Does the shape of life matter? “It is better to burn out than to fade away.” These are the lyrics from Neil Young’s song ‘My my, hey hey’ and, famously, featured on Nirvana lead singer, Kurt Cobain’s, suicide note. They capture a common thought: that the trajectory of your life matters. Imagine two lives, both full of equal amounts of pleasure and joy. Despite their seeming equality, you might prefer one over the other simply because its trajectory is more appealing; because it doesn’t end with a long period of stagnation and decline; because it goes out on a high. Philosophers have long been puzzled about the importance of shape to the well-lived life. There are some — usually hedonists — who think it does not really matter at all. What matters is the aggregate amount of pleasure and pain. If you happen to prefer a life with an upward-sloping trajectory (i.e. one where there is more pleasure toward the end), then this might affect your overall experience of pleasure and pain, and hence might give grounds for favouring the upward-sloping trajectory. But if you have no such preference, then shape doesn’t matter. There are others who vehemently disagree. They are with Neil Young and Kurt Cobain. They think it is genuinely better, for reasons that have nothing to do with aggregate amounts of pleasure and pain, to have an upward sloping trajectory to your life. They usually justify this on the grounds of narrative arc or relationality. In other words, they favour the upward-sloping trajectory because it tells the better story. In her paper “What does the shape of a life tell us about its value?”, Christine Vitrano takes on the narrativists and defends the hedonists. I want to look at her argument in what follows. Although I ultimately agree with her, I find myself initially intuitively attracted to the narrativist view. I hope to explain why below. One of the most impressive things about Vitrano’s article is how comprehensive it is in both reviewing and quoting from fans of the narrativist view. By my tally she quotes from at least nine different philosophers who have defended some version of the narrative view. This comprehensive review of the literature clearly proves the point that narrative view is widely favoured. 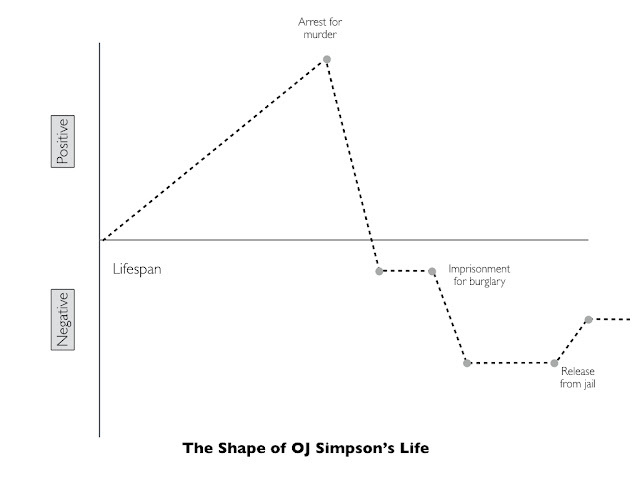 OJ Simpson: OJ Simpson’s life displayed a reasonably solid upward trajectory until he reached his mid-forties. He was a successful football player, actor and sports commentator. Then he was put on trial for murder and, although acquitted, many were convinced of his guilt. His subsequent years have displayed a noticeable downward trajectory. He was arrested and sent to jail for burglary in 2008. He was sentenced to 33 years but was released on parole in 2017. He has largely stayed out of the limelight since then. JO Nospmis: JO Nospmis started out life on a downward slope. She was involved in gang-related violence and crime from an early age. She was suspected of murder and convicted for armed robbery in her mid-20s. She was later released and given the opportunity to teach basketball at a club for troubled youth. She made a success of this, attracting widespread acclaim and eventually going on to a successful career coaching college basketball and as a sports commentator. Let’s assume that both lives contain the same aggregate amount of pleasure/joy and suffering. The only difference between them is the trajectory. Who’s life would you rather live? 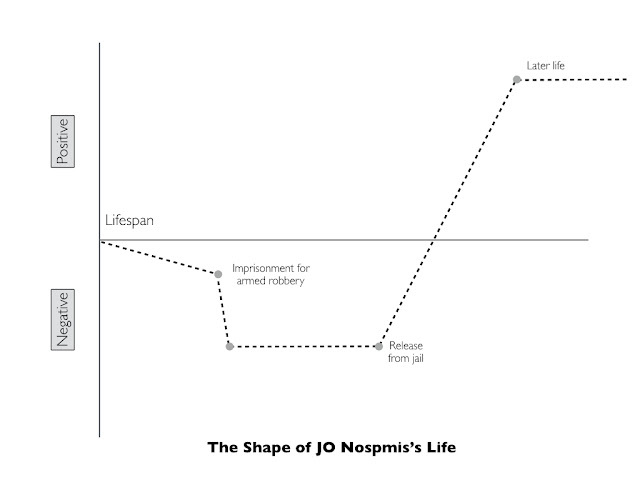 Dorsey, and others, think it is obvious enough that you would prefer to live JO Nospmis’s life. The intuitive appeal of her trajectory over OJ’s could itself be taken as evidence for the importance of the shape of a life. But something more can be said too. According to Dorsey, and other narrativists, the shape matters because the value of the events within your life can be altered by their relationship with past and future events. OJ Simpson’s great achievements early in his life are undermined by his later downfall. We see the early achievements in a different light given what we now know. The reverse is true for JO Nospmis. Her early crimes and misdemeanours are redeemed by her later successes. We see her story as one of triumph over adversity, not downfall from glory. The important point is that the value of any particular event within your life is not completely determined by that event in and of itself. It takes on additional meaning and value, depending on what happened before and after (i.e. on its relationship to other events). Being successful at a job interview might seem wonderful at the time, but what if taking up that job becomes the major causal contributor to your relationship breaking down? What if you are miserable and unhappy in the job itself? When you look back, you might rue your success, no matter how joyous it was at the time. It is not quite as sweet in light of the subsequent failure. 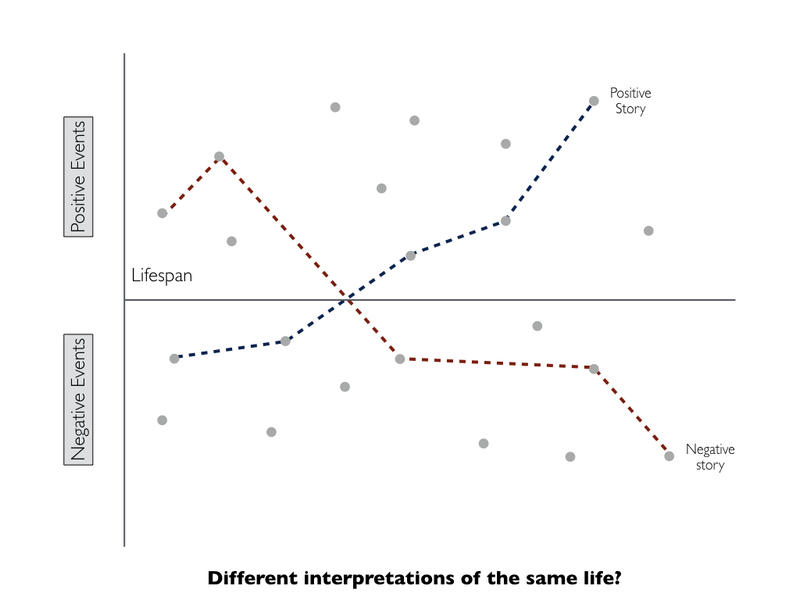 The fact that the value of an event seems to depends on its relations to past and future events provides a powerful compelling reason for thinking that shape matters to the value of a life. Most theorists cash this out in terms of the “narrative” relations between past and future events (i.e. they think that what matters is that your life tells a good story). Dale Dorsey suggests that other kinds of inter-event relationality might make a difference too. He just doesn’t specify what these might be, leaving narrativity as the only obvious candidate. I must say I find myself intuitively drawn to the narrativist view: it makes sense to think that the order and sequence of events has some effect on the overall value of a life. But Vitrano is not a fan of this. Having read her criticisms, and reflected a bit more on the problems with narrativist views, I tend to agree. The basic problem is this. Life is complex and messy. It consists of many events and experiences — some good and some bad. Constructing a narrative out of this complex mess of details requires both simplification and interpretation. Some events have to be treated as important and significant, and others have to be ignored or overlooked. Some events have to be knitted together into a narrative arc (or other set of relations) and some events have to be discarded or made to fit that arc. None of this is straightforward. Different people might highlight different events and construct different narrative arcs out of the same mess of details. This could have a dramatic impact on how we value the life as a whole (if we assume that shape matters). You can see this very clearly in debates about historical figures. Take, for example, the life of Winston Churchill. To many people, he is a hero and saviour. Biographers have written hagiographic accounts of his life. They emphasise his dynamism, his energy, his impressive roster of publications and public contributions, and, above all, his standing up to Hitler and leading Britain through the darkest days of WWII. Others take a different view. While not completely discounting his achievements during WWII, they highlight his apparent racism, imperialism, jingoism and war-mongering, and his history of bad strategic judgments. To them, he is closer to a villain. Both groups are looking at the same life — the same complex mess of events, dispositions and experiences — and constructing different stories. The truth about Churchill — if there is any such thing — is probably too complex too fit into a simple ‘villain’ or ‘hero’ arc. Yet simple moral fables are what we tend to look for when making stories of our lives. In this example, we are judging the life of another person. But the same problem arises when we are evaluating our own lives. Many things happen to us as individuals. What we choose to emphasise and what we tell ourselves about events can make a big difference to how we value our own lives. Indeed, this is a key insight underlying a lot of contemporary psychotherapy. Depression and anxiety can often be attributed to the stories we tell ourselves about our selves. Therapists can help patients by offering alternative interpretations and getting them to tell more positive stories. Looking at my own life, I find that I can interpret what has happened to me in a positive light — I have been reasonably successful in my educational and academic endeavours, I have a family and friends who seem to like me, I think I also continue to improve in many of my skills and abilities — but I can also see it in a negative light — I have squandered lots of opportunities, I often find that I am stagnating or coasting, and I frequently fail to live up to my own ideals in my relationships with others. Is my story one of continued success or one of repeated personal failure? I can go both ways on this, depending on my mood. The actual shape of my life (if there is such a thing) is epistemically opaque. I have illustrated this problem, stylistically, in the diagram below. Each dot represents a life event. 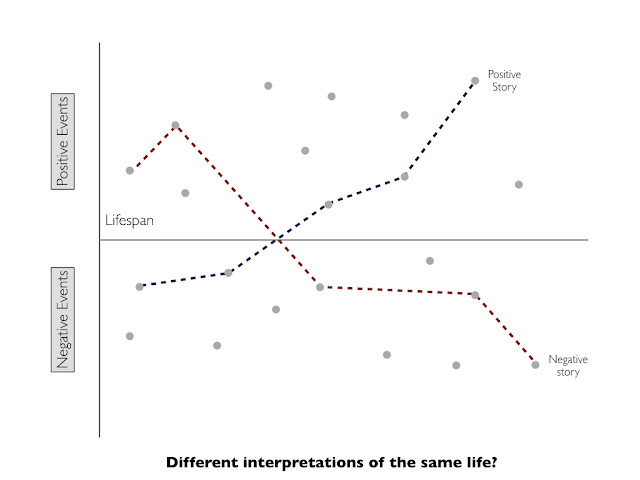 The two different pathways through life’s events represent two competing interpretations of the shape of life. There is another problem lurking in the narrative view too. It faces particular problems when it comes to the natural shape of a human life. Although all human lives are different, most follow a typical arc: childhood is a time of growth and experimentation; adulthood is a time of focus and achievement; and old age is time of deceleration and gradual decay. In other words, to go back to the opening quote, most human lives peak and then fade away; they do not go out in blaze of glory. If we take the narrativist view seriously, this natural tendency to fade away could have serious implications for how we approach our lives. Should we all desire death as soon as we reach our peaks? As Vitrano points out, if taken to an extreme, the narrative view “could lead to the absurd conclusion that if one achieves a ‘once in a lifetime’ accomplishment…one is better-off committing suicide right afterwards so as to avoid the eventual decline that will follow” (Vitrano 2017, 574). All of this convinces me that it is a mistake to place too much emphasis on the shape of one’s life to one’s overall assessment of its value. Vitrano goes further and argues that it means we should favour the hedonic view (that what really matters is happiness not shape), but I don’t follow her all the way to that conclusion. I still find myself clinging to some semblance of the narrative view. I just think that outside of extreme and obvious cases (e.g. the OJ Simpson case), the narrative shape of a life won’t make that big a difference to its overall value. Life is just too complex for that. Once in a Lifetime: Should you plan your life? Have you ever met somebody who has it all worked out? Someone who had their life goals identified from a young age and worked their damnedest to achieve them? Someone with tunnel vision and focus? I know I have. I have met people who have known exactly what they want to do and how they want to do it since their early teens. At times I envy them. They have such certainty and conviction. They never seem waver from their plan. I’m closer to 40 than I am to 22, so I’m hoping I’ll still be pretty interesting by then. All of this makes me suspicious of people who have it all planned out. They seem alien and inhuman to me. How could you have it all planned out? And since I am constantly seeking intellectual confirmation of my own prejudices, I decided to read up about the value of having a life plan. It turns out there is a rich philosophical tradition that favours the idea of having a life plan, but there is also considerable scepticism about the wisdom. Charles Larmore’s article ‘The Idea of a Life Plan’ is one of the better known contributions to this debate. In it, Larmore argues against the idea of having a life plan, going so far as to suggest that if you live your life according to a plan it will be necessarily impoverished or less ideal. Is he right? I tend to think he is but let’s see what the argument is before passing judgment. I mentioned above that I find those who plan their lives to be ‘alien’ or ‘inhuman’. This is, as I admitted, a statement of my own prejudice. I just can’t wrap my head around people who plan their lives. The main reason for this is that I can’t ever imagine knowing exactly what I want to do with my life. A life is a branching tree of possibilities. There are many things you could do with your time here on earth. How do you know you are doing the right thing? This is a question I wrestle with constantly. I don’t think it is possible to answer with any degree of certainty and conviction. You can adopt temporary or short term goals, but they must always be open to revision and correction. You could make a choice, find out it was a bad one, and have to change track. The fact that this can happen so often is what makes me suspicious of life plans. Look at the language in this passage. Aristotle is telling us that, if we have the freedom to do so, we ought to rationally reflect on what matters to us, fixate upon some goal, and keep that goal front and centre in all our activities. To not have a rationally ordered plan when you have the freedom to create one would be ‘extreme folly’. That seems like a damning indictment of the kind of life I lead. Larmore suggests that this Aristotelian ideal traces itself back to the Socratic injunction that the “unexamined life is not worth living”. The suggestion in Aristotle, and other philosophers, is that you need to step back from the messy, day-to-day, details of your life — all the in-the-moment choices that you have to make — and look at your life from a more timeless perspective. Life may well be a branching tree of possibilities, but what path through that tree are you going to take? You need to decide that (and decide well) in order to live a good life. But why? One reason is simply the fear that your life risks aimlessness and purposelessness if you don’t. If you don’t have a clear conception of what your particular good life will consist in, you might get buffeted around by the winds of change. You might not be able to resist the temptation to evil or vice. You may never achieve anything of worth or value. You will be a victim of circumstance not an author of your own destiny. [I]n Rawls’s view prudence [i.e. planning] does ensure that, should we be disappointed by unexpected developments, we still will have nothing to blame ourselves for. We will have done the best we could. This gets very close to the ‘regret minimisation’ ideal of the good life that I discussed in a previous article, i.e. the idea that the good life is the one with the fewest regrets and hence fewest opportunities for self blame. The difference here is that planning is seen as an essential bulwark against regret and self blame. The Need for Surprise: A good life consists of at least some good surprising experiences, e.g. the lucky break or the unexpected lover. A life plan is incompatible with this. It is key to Larmore’s argument that you cannot plan for surprise goods, at least not really. You can have relatively loose plans that are open-ended with regard to their specific content. For example, part of your life plan might be to find an intimate partner and settle down with them to start a family. This plan may say nothing about who the intimate partner must be and you could allow for some spontaneity and surprise when it comes to identifying the right person. Larmore accepts that a suitably sophisticated life plan can allow for spontaneity and surprise of this sort. His argument is simply that planning is the wrong way in which to think about truly surprising goods. There are two reasons for this. The first is that the surprise itself is often part of what makes the experience or outcome good (“I didn’t expect that I would fall in love with you but I’m delighted that I did”). The second, and more important, is that planning for a surprising good gets the order of justification/warrant mixed up. A surprising good is something that disrupts or confounds your expectations. It gets you to reconsider or change path, to alter your purposes or plans to the surprise and not vice versa. You cannot direct your plans toward the surprise: it wouldn’t really be a surprise if you could. The Knowledge Problem: You cannot rationally plan your life at any given time T1 because that assumes you have perfect knowledge of what constitutes the good for you at T1, which is highly unlikely. You gain knowledge of what is good for you through experience and that, necessarily, impacts on your purposes and plans. This isn’t simply a repeat of the above-mentioned problem that the world is unpredictable and so your plan may fail to be implemented. It is the problem that it is impossible take the ideal timeless perspective on what is good for your life as a whole. You always make plans at a particular moment in time and your conception of what is good for you at that moment in time is always partial and incomplete. You might think that being a neurosurgeon is good for you when you are 12 years old (I did) but then later realise that it would be terrible choice for you since you are squeamish and your hands shake uncontrollably whenever you hold a surgical implement. You might think that someone is the ideal spouse when you first meet them and then later learn that they are anything but. Our conception of what is good for us is transformed by our experience and is not something that can be easily planned for at a particular moment in time. Indeed, it might be even worse than that: we might actually frequently err in predicting and planning what is good for us, so much so that we should avoid an excess of planning. This is the central thesis in Daniel Gilbert’s book Stumbling on Happiness. Larmore doesn’t mention this since his article was published before the book came out but Gilbert claims that people frequently ‘miswant’ things, i.e. they predict that some experience or outcome will make them happy, but when they achieve it they learn that they are wrong. More often than not, people just ‘stumble’ upon happiness. If this is right, then it would seem to cast the wisdom of planning your life into considerable doubt. To be clear, however, Larmore is not completely averse to the role of plans and purposes in life. He thinks it can be a good idea to adopt short or even reasonably long-term plans. Some focus and sense of direction can be valuable. You just shouldn’t have a single, stable, overarching plan for your life as a whole. Over the course of your life as a whole you need to be looser and maintain some appropriate balance between focus and serendipity. 3. Conclusion: Same as it ever was? I find myself to be very sympathetic to Larmore’s arguments. But it would be remiss of me not to note some criticisms of them. In a lengthy and patient analysis, Joe Mintoff has defended the idea of a life plan from all the major lines of attack, including those propounded by Larmore. The gist of his position is that Larmore understates the value of planning, overstates the value of surprise, underestimates the coherence of planning for serendipity and ignores various ways in which we can acquire the knowledge needed for planning (e.g. by learning from the example of others). In the end, however, Mintoff and Larmore’s positions don’t seem to be that different. Mintoff isn’t a doctrinaire and rigid planner. He thinks a life plan has to have some ‘revocable stability’. In other words, he accepts that we may need to revise our goals from time to time. He just doesn’t think this is going to happen as frequently as Larmore seems to suppose. Likewise, Larmore isn’t a fan of chaos and anarchy. He thinks planning has some role in life. Furthermore, and interestingly, both Mintoff and Larmore accept that life tends to be divided into phases of experimentation, when planning is not the ideal thing to do, and phases of focus and determination, when planning becomes more salient. In particular, they both suggest that childhood should be seen as a phase of experimentation and adulthood is a phase of planning and focus, before some tailing off and denouement in old age. Mintoff makes more of this, but it is present in both. Balance seems to be the key; the rest is just a matter of emphasis. Still, there is one thing that Mintoff says that gives me pause. In response to Larmore’s concern that we cannot fully predict or know what is good for us, Mintoff suggests that we can learn something from the typical life plans of those in our communities. If the typical plan involves education, success in a career, and a rearing a family, then we have lots of case studies from which we can learn whether this is a good fit for us. 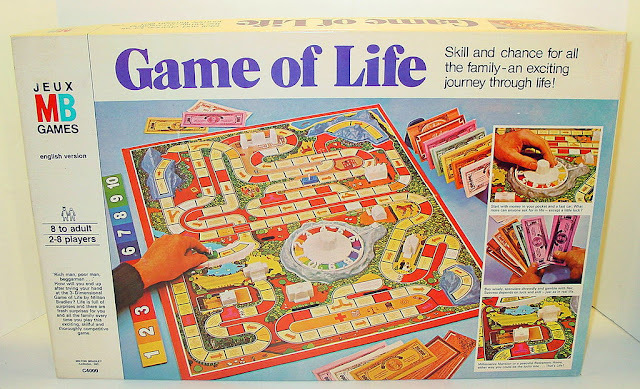 I think Mintoff sees these typical life plans (let’s call them ‘off the shelf’ life plans) as a boon. But I see them in another light. I think my biggest concern is that if you don’t make a conscious effort to plan your life, then you will simply fall into (or have imposed upon you) one of these off the shelf life plans. Maybe I should have planned more carefully? Here's another new paper of mine. This one makes the case for robot friends. This actually started life as one of my more popular blog posts. The paper is obviously more fully developed than the blog post. 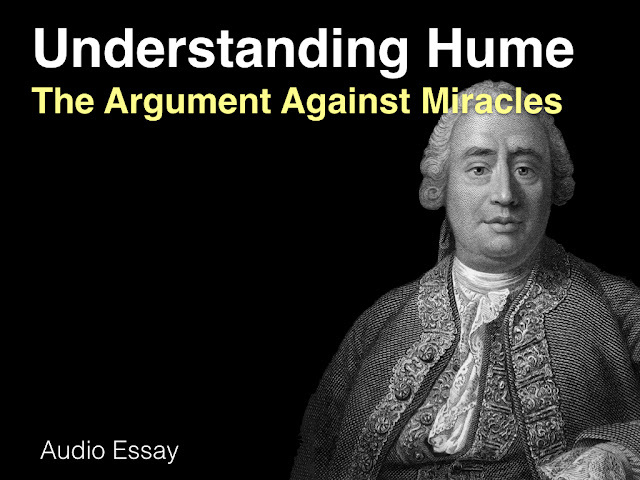 You can also listen to me give a short precis of the argument in the video above from about 20:48-31:00 (if you press play the video should start at the right time). Full details of the paper and links to preprint versions are below. Abstract: Friendship is an important part of the good life. While many roboticists are eager to create friend-like robots, many philosophers and ethicists are concerned. They argue that robots cannot really be our friends. Robots can only fake the emotional and behavioural cues we associate with friendship. Consequently, we should resist the drive to create robot friends. In this article, I argue that the philosophical critics are wrong. Using the classic virtue-ideal of friendship, I argue that robots can plausibly be considered our virtue friends - that to do so is philosophically reasonable. Furthermore, I argue that even if you do not think that robots can be our virtue friends, they can fulfil other important friendship roles, and can complement and enhance the virtue friendships between human beings. 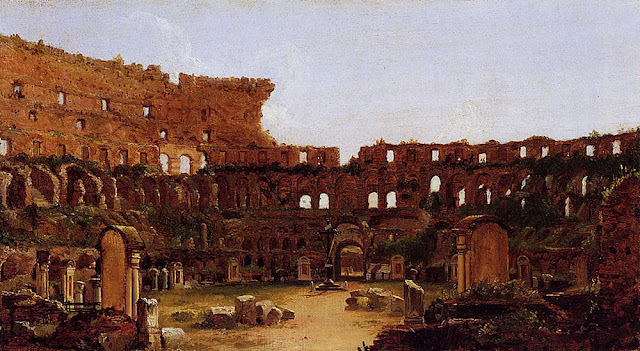 If you ever visit Rome, and wander through the Colosseum or Circus Maximus, it’s hard not to be struck by a sense of fragility and impermanence. Here are the remnants of the most powerful and complex of ancient European societies, now reduced to ruin and rubble. How did this once proud and mighty empire crumble? Joseph Tainter’s 1988 book The Collapse of Complex Societies has an answer to that question, and to similar questions you might ask about the collapse of other ancient societies (Mayan, Incan, Babylonian etc). His book is widely cited and discussed among those who are interested in the topic of civilisational collapse. Having now read it, I can see why. Tainter presents his views with a logical simplicity that is often lacking in these debates, only setting out his own theory after having exhaustively categorised and dismissed alternative theories. What’s more, his own theory is remarkably easy to state and understand: societies collapse when they hit a point of rapidly declining marginal returns on their investments in problem-solving capacity. Despite this, I have yet to see a really good summary of his theory online. I want to provide one in this post. I’ll try to focus on the essential elements of Tainter’s theory, and not on his dismissal of rival theories or his detailed case studies. I’ll also aim to be critical of the theory where needed, and to provide some reflections on whether it can be applied to contemporary societies at the end. These reflections will be somewhat idiosyncratic, tied to my own interests in democratic legitimacy and technology. 1. What does Tainter Mean by the ‘Collapse’ of ‘Complex Societies’? Tainter’s theory is premised on the assumption that societies do indeed collapse. That’s the motivation for his entire book: the fact that he thinks is in need of explanation. You might suppose that this is a relatively uncontroversial assumption. Tainter starts his book with a comprehensive list of examples of societies that have collapsed. They include: the Western Chou Empire, The Egyptian Old Kingdom, The Hittite Empire, the Western Roman Empire, and Lowland Classic Maya. What could be more conclusive than that? And yet, despite its seeming obviousness, the notion that societies do undergo something akin to ‘collapse’ is actually controversial among scholars of the ancient world. Complex Society = A society is complex when it has a lot of heterogeneity, specialisation and centralised control. In other words, when there are many different institutions, organisations, social functions and social roles, bound and integrated together into some centralised government. Complexity, according to Tainter, is not an all or nothing proposition. It comes in degrees and the precise delineation between a complex society and a ‘simple’ society is disputable. The creation of the ‘state’ is one of the key steps in the development of complexity, but when exactly a society transitions from being a band or tribe to a state can be tricky to pin down. It follows from this, incidentally, that the loss of social complexity also comes in degrees. 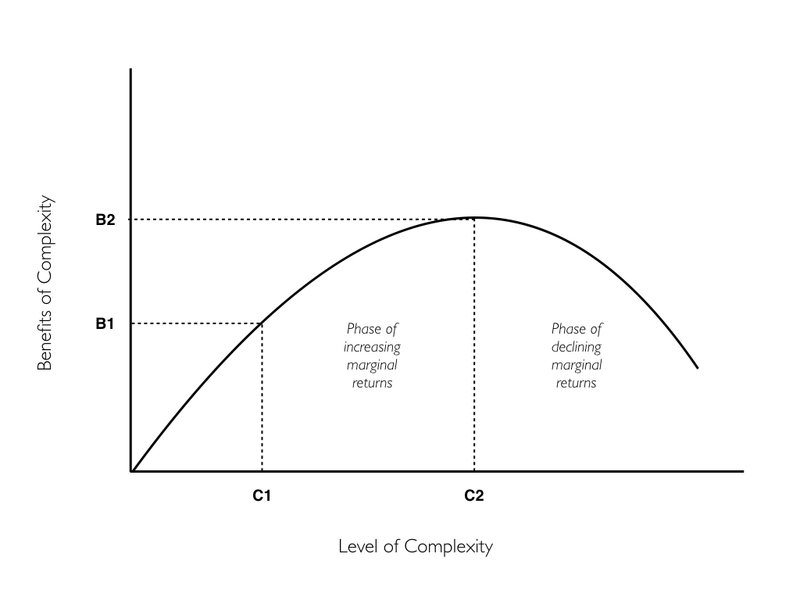 Thus, collapse, like complexity, is itself a ‘continuous variable’ (Tainter 1988, chapter 2). How exactly do complex societies emerge? Tainter spends some time discussing this. I won’t rehash the discussion here. There are really only two key points that emerge from it — at least from the perspective of understanding his theory. The first is that the emergence of complex societies has something to do with problem-solving. Complex societies emerge and sustain themselves by bringing benefits to their members, i.e. by addressing and overcoming barriers to their existential and psychological needs. This doesn’t mean that the benefits are evenly shared. Quite the contrary. Complex societies are often marked by profound inequality and hierarchy: some people benefit much more than others. The second point is that, once they have emerged, complex societies are always threatened by some degree of internal dissent and rebellion (e.g. some people who feel that they aren’t getting the most out of the problem-solving bargain). They have two basic strategies for dealing with these threats: (i) boosting their perceived legitimacy or (ii) coercion and control. The latter requires no explanation. The former is a somewhat subtle idea. One way to boost legitimacy is to increase problem-solving capacity (and share the benefits to the dissenters). The other way is to inculcate the belief that the institutions of the state are sacred in either a religious (divinely mandated, righteous etc) or non-religious (just, moral, democratic) sense. A combination of both is probably required for legitimacy. That’s enough by way of stage-setting. The bottom line is this: Tainter’s theory tries to explain the collapse of complex societies, where complexity is a function of the institutional heterogeneity of a society, and where collapse arises when there is a rapid and substantial decline in this complexity. Now that we know what it is that Tainter is trying to explain, we can turn our attention to the explanation itself. In chapter 4 of The Collapse of Complex Societies he sets out his explanatory theory. In chapter 5, he applies it to three historical case studies: the collapse of the Western Roman Empire, the collapse of classical Mayan civilisation, and the collapse of the Chacoan society (a North American society based around modern-day New Mexico). I’ll be skipping the case studies to focus on the theory itself. I do, however, recommend looking at them to get the full sense of how his theory works. You can do so in this article or this video lecture. (P1): Human societies are problem-solving organisations that generate benefits (B) for their members and, in order to develop and sustain themselves, they must continue to solve problems and generate benefits. (P4) Increased investment in socio-political complexity usually yields higher returns (B ↑) but this usually comes at an increasing per capita cost so that, at a certain point, the marginal benefits (mB) on increased investment are outweighed by the marginal costs (mC). (P5) If mC > mB at an increasing rate, societies will collapse (i.e. experience a rapid and significant decline in socio-political complexity). The first three propositions are conceptual in nature. Indeed, they almost have the quality of truisms or platitudes. I don’t see how P2 could be denied: it is like a natural/physical law. P1 might be questionable, but it looks basically right to me. One thing you might worry about is whether problem-solving capacity alone is what sustains a society. As highlighted earlier, societies can also sustain themselves by boosting perceived legitimacy and through coercion. So maybe, at a certain point in their evolution, societies don’t need to keep solving problems in order to survive. That, however, seems unlikely and when you think about it a bit more both strategies really end up confirming the central importance of problem-solving capacity. After all, legitimacy is, at least in part, determined by problem solving capacity and coercion is itself a costly, problem-solving exercise and thus confronts the same basic cost-benefit equation alluded to in P3. It’s really P4 and P5 that are the heart of Tainter’s theory and most of his attention in chapter 4 is dedicated to proving that P4 is true, i.e. that complex social organisations really do confront declining marginal benefits (chapter 5 looks to whether P5 is confirmed by the historical record). Tainter gives four examples of P4 playing out in human societies. The first example has to do with agricultural production. Using work done originally by Ester Boserup, Tainter documents how (prior to mechanisation) agricultural intensification resulted in declining marginal benefits (i.e. declining marginal yields). People in foraging societies usually don’t have to work all that hard to secure their basic calorie needs. We see this by looking at contemporary equivalents where as little as 2.5 hours of work per day per person is all that is required. Contrast that with non-mechanised agricultural societies. Back-breaking work from dawn til dusk is often required and yet it generates diminishing marginal returns per unit of labour. Tainter uses a case study from farming communities in Northern Greece to illustrate this. The data from this case study suggests that “labor applied at an annual rate of about 200 hours per hectare is roughly 15 times more productive (in returns per hour of labor) than labor applied at 2000 hours per hectare” (Tainter 2000, 11). The second example has to do with knowledge production and information processing power (broadly speaking the “intelligence” of human society). Tainter uses lots of examples to illustrate this problem, all broadly having to do with the returns on education and research and development. He documents how the early years of education generate far greater returns than the later years, and how most industrial societies seem to be undergoing a decline in their rates of innovation. This is actually something that has become better documented since Tainter wrote his book. A recent paper from Nicholas Broome and colleagues, for example, suggests that we are currently undergoing a significant marginal decline in the returns on research and development spending. Exponentially more money is being invested in the ‘education-research-industrial’-complex in order to sustain existing levels of growth. Michael Nielsen and Patrick Collison also have a nice article summarising this problem that looks at several different indicators of marginal decline. None of this should be surprising. There is a ‘low hanging fruit’ principle at play in most fields of research and development: the easy solutions/theories/insights are developed first and then it becomes progressively more difficult. The third example has to do with bureaucratic power and control. Tainter gives several well-documented examples of administrative bloat and mission creep in bureaucratic organisations, particularly the military and Navy. These organisations are often central to societal problem-solving, but they tend to proliferate (i.e. more and more specialised organisations are developed to deal with discrete problems) and grow in size to cope with the challenges. This usually results in declining returns as more costly administrative staff are hired to manage the complex organisations compared to relatively fewer front-line workers/soldiers/doctors etc. We see this problem of administrative bloat and declining returns crop up over and over again in human history. Modern universities are a good illustration. The fourth example has to do with declining rates of overall economic productivity. As societies increase in complexity they might initially generate high rates of economic growth but, over time, as they grow more complex, they tend to sustain relatively inferior rates of economic growth and have to invest more money, time and effort to sustain these rates. This is often linked to the problem of declining returns on education and research. Indeed, this is something that Nicholas Broome and his colleagues document quite well in their paper on declining rates of innovation. The fact that such examples can be compiled does not mean that all economic trends follow the same curve, nor that socioeconomic processes in complex societies follow only the law of diminishing returns. It also does not mean that such trends occurring in any specific sphere are irreversible. Where this law is operative, however, serious consequences can be expected, and those are the situations of interest here. Comments like this provide some reassurance, particularly when it comes to assessing our own era. Maybe we can buck the trend? Still, Tainter’s point seems to remain valid. Complex societies can run into the problem of declining marginal returns and when they do the prospect of collapse looms large. He sums it up by drawing a curve that he thinks maps out the common relationship between the benefits and costs of increased, and captures the dilemma confronted by all societies that must invest in increased complexity. This curve is not based on any data. 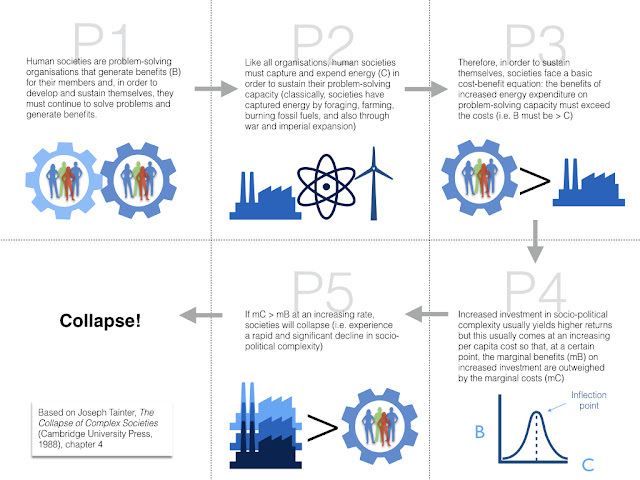 It is simply a mental model that we can use to understand the process of collapse. 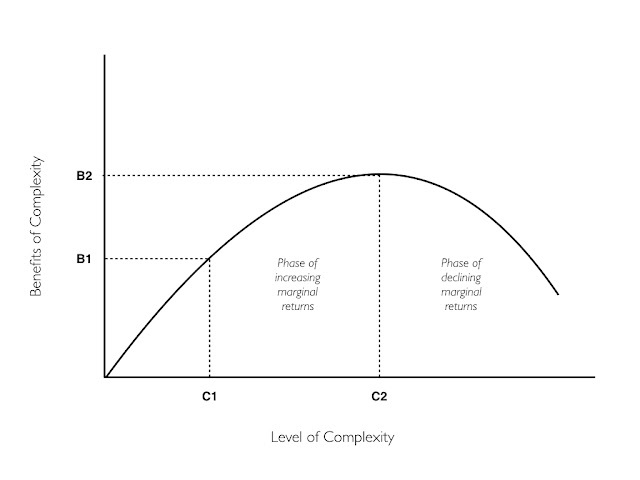 The idea is that societies often do well in the early stages of complexity but then they peak (at point B2, C2 in the diagram above) and enter a state of decline. At this point, things are often still getting better, but at a declining rate and if this rate of decline speeds up, the overall benefits of complexity will be outweighed by their costs. Societies will have to spend more resources to ensure stability, either through boosting legitimacy or increased coercion, but these solutions are often only temporary, stop-gaps. At a certain point, the decline becomes unstoppable. That, in a nutshell, is Tainter’s theory. There are many ways to criticise Tainter’s theory. The most obvious would be to challenge its empirical bona fides. As Tainter himself notes, it’s very hard to prove or confirm (or even falsify) a theory of collapse. We can’t run controlled experimental tests. We are forced, instead, to interpret the historical evidence and see whether it fits the theory. This is always a problematic exercise as people are inclined to twist or exclude facts in order to promote their preferred theory (they may do this unintentionally or without malice). That said, there have been some attempts to develop computerised models of human societies that can test these different theories. I know of at least one attempt to do this with Tainter’s theory which suggests that it can explain societal collapse. But I suspect that these model-building exercises are also fraught with difficulty, particularly when it comes to deciding what goes into the model. More generally, and perhaps more seriously, it is worth noting that there are archaeologists and historians who doubt the very idea of societal collapse. I mentioned this earlier. After Jared Diamond wrote his best-selling book Collapse — which is somewhat similar to Tainter’s in that it tries to document and explain historical examples of societal collapse — a group of scholars got together to write a detailed rebuttal of the examples he used. They argued that human societies are actually remarkably resilient: they shift, evolve and adapt rather than collapse. This is a theme taken up by Guy Middleton in his 2011 book Understanding Collapse which reviews all the infamous examples of societal collapse and suggests that the evidence for actual collapse in each case is limited: aspects of a given society might decline, certain buildings or settlements might be abandoned, and particular regimes/states might be overthrown, but this does not mean that a civilisation as a whole has collapsed. Middleton wrote a short summary of his book’s thesis for Aeon magazine that you can read online. Tainter might be able to escape these criticisms by arguing that, for him, collapse is a matter of degree. He is not claiming that societies disappear or self-destruct. He is claiming that they experience rapid declines in complexity. But this raises another problem. There is a certain ‘fuzziness’ to each of the concepts Tainter uses to support his theory and that makes it a bit too easy to massage historical data to fit the theoretical parameters. One example of this is the idea that collapse arises from a ‘rapid’ and ‘substantial’ decline in socio-political complexity. But what is a rapid and substantial decline? Some of the examples Tainter uses involve societies that changed over the course of centuries. Is that ‘rapid’? I’m not so sure. Furthermore, by zooming in on particular examples of apparent decline in complexity, there is a sense in which the theory misses the bigger picture, namely: that human civilisation really seems to be defined by a remarkable increase in socio-political complexity over time. Sure, there have been pockets of decline here and there, but in the long sweep of history things have gotten much more complex. This brings me to what I think is the most important and interesting criticism of the theory. Remember, Tainter claims that society’s woes are caused by a decline in the marginal return in problem-solving ability. You might argue that this can be averted by some new technological innovation — one that boosts society’s problem solving ability. This technological breakthrough would allow society to shift to a new cost-benefit curve and avoid the problem of declining returns. A classic example would be the shift from agricultural society to industrial society. This was made possible by a series of technological breakthroughs that enabled us to more effectively harness the energy from fossil fuels (initially, then other power sources were discovered). This boosted Western European society’s problem-solving ability by massively increasing its energy capture, as well as the efficiency with which it could utilise that energy. This is something documented at length in Ian Morris’s work on societal development. Tainter is aware of examples like this. Indeed, he discusses the industrial revolution in some of his work, noting that it was, to some extent, a lucky breakthrough because English society was encountering the problem of declining marginal returns after its shift from charcoal-burning to coal-burning (Tainter 2000). The steam engine came at just the right time. Furthermore, and more generally, he argues that even if a technological breakthrough is made it is often a temporary solution at best. Ultimately, the problem of declining marginal returns will be encountered by this technological breakthrough. I wonder about this though. It puts me in mind of debates about ‘peak oil’ and other about finite resources. These debates rely on the same, basic logic as Tainter’s theory. They all assume that we are overly dependent on a particular resource (oil, coal, gas etc) and that this resource is finite. Granting this finitude, we are eventually going to ‘peak’ in our exploitation of the resource and enter a period of terminal decline. This logic is ineluctable: if the resource in question is finite it simply must be true that if we continue to exploit it we will reach a point of decline. But the problem is that, unless we actually know what the full stock of the relevant resource is, we don’t know where we are on the relevant exploitation curve. In his book The Wizard and the Prophet, Charles Mann points out that people have repeatedly claimed that we have reached (or are about to reach) ‘peak oil’. This has been true since the 1800s. These people have been repeatedly been proved wrong. We are producing and consuming more oil today than ever before. We don’t know where we are on the exploitation curve. It seems to me that Tainter’s theory encounters the same basic problem: maybe all innovations in problem-solving ability will eventually encounter the problem of declining returns. But how confident are we at our ability to predict when this might be? Furthermore, there are more optimistic views out there. The economist Julian Simons, for example, famously argued that human problem-solving ability is an infinite resource, not a finite one. So the ineluctable logic of the ‘peak oil’ argument may not apply. That said, I’m not pollyannish about the prospects of technological solutions to our problems. Technological innovations might help us to avoid collapse, but they themselves often create new problems that need to be solved. This is not something that Tainter makes much of in his 1988 book, but it is something that greatly vexes contemporary researchers, particularly those focused on the topic of ‘existential risk’. Nick Bostrom’s paper on the ‘The Vulnerable World Hypothesis’ neatly summarises these fears, suggesting that technology can both solve our problems and make our world more vulnerable to existential collapse. All of which leads to the inevitable question: how do Tainter’s theories apply to the present day? After all, that’s really what motivates the historical inquiry, isn’t it? Perhaps some of us are interested in understanding the decline of the Roman Empire for its own sake, but lurking in the back of most people’s minds is the fear that our own civilisation is about to collapse. Well, as you might imagine given my previous remarks, I’m somewhat sceptical about the wisdom of asking this question. The logical simplicity of Tainter’s theory, combined with its fuzziness, makes it both tempting and dangerous to apply it to our present day. Certainly, there are plenty of warnings out there about the current limits in our problem-solving capacity and the environmental challenges we face in the coming decades (Charles Mann’s aforementioned book The Wizard and the Prophet is an excellent primer on these challenges). But it’s hard to say where exactly we are on Tainter’s cost-benefit curve, or whether we might shift to a new curve with some technological breakthrough. Nevertheless, I do want to end with two reflections on the application of Tainter’s theory to the modern era. The first has to do with democracy. Democratic institutions of governance are currently the most favoured problem-solving system in the world. And yet many people perceive them to have entered a state of stagnation and decline. This is a theme taken up in David Runciman’s book How Democracies End (far better than the more hyped American equivalent How Democracies Die), which argues that mature democracies have entered a ‘mid-life’ crisis. A democracy’s primary tools for increasing its problem-solving capacity and its perceived legitimacy is to enlarge the voting franchise and increase transparency and accountability. But many mature democracies have hit the point of declining marginal returns on these mechanisms. They may very well be at Tainter’s inflection point. This brings me to the second reflection, which has to do with the role of technology, particularly artificial intelligence, in boosting our problem-solving capacity. According to some of its advocates, a significant breakthrough in AI could be the deus ex machina we need to solve our emerging problems. Instead of relying on imperfect, squabbling human intelligence we could rely on a more perfected artificial form. This is an argument that Miles Brundage makes explicit in his paper on the case for ‘conditional optimism’ about AI, and is implicit in other work on AI and algorithmic governance. The problem with this, however, is that technological solutions of this sort suffer from a significant legitimacy crisis. We see this everyday in scandals around tech companies. 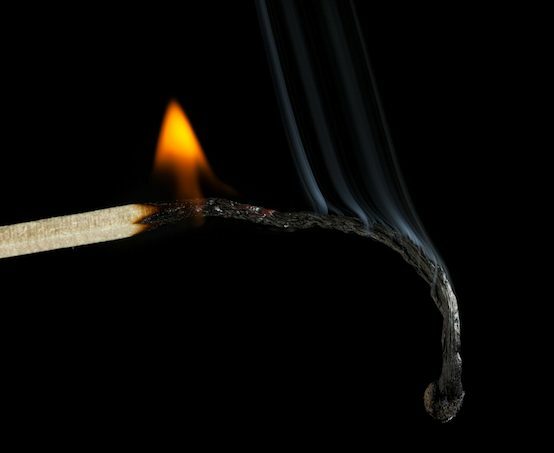 It could be that we face a hard tradeoff in the not-too-distant future: either we have legitimate problem-solving institutions that face the problem of rapidly declining marginal returns or we have fast, efficient and technologically-mediated institutions that suffer from a legitimacy deficit. Although I did not express it in these terms, this was effectively the argument in my paper “The Threat of Algocracy”.